It was my first ever exposure to Guruji and His teachings. I must confess it was beyond any expectations. After hearing the first talk on “The Greatness of Guru and Guru-Bhakti”, I was totally taken aback by the talk. It was not just insightful but very inspiring. I was amazed by the depth and insight of RamuJi and his surrender to His beloved Guru. It triggered an already present desire to have a Guru and a personal relationship with Him. 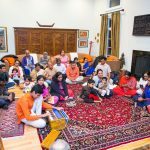 The next day’s satsang at our home on “Essence of Sundarkand” was very nice. I have heard interpretations of Sundarkand before, but PoornimaJi’s talk was very very nice. It was the first time I heard how HanumanJi represents a God sent Guru for the Jiva caught-up in this samsara with the assurance that God is not far behind. Evening satsang at SSVT about “The Greatness of the Divine Name and Maha-mantra” was very eye-opening. 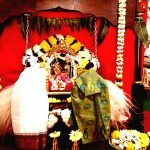 I had never known the uniqueness of the Maha-mantra and its divine potency. This session has left us chanting this divine mantra even after the program in this area is over. Sunday’s home satsang on “The Greatness of Ganesha Chaturthi” was heart melting. The talk explained in details about the origin of Vedas, Om and the embodiment of Om “Our Beloved Lord Ganesha”. The audience was very very inspired and moved by the talk. 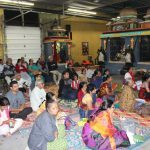 Many had requested for more satsang opportunities which might be organized at the end of RamuJi and Poornimaji’s lecture-tour in the US. 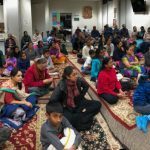 PoornimaJi’s talk on “Divine Mother – Grace Personified” was very touching. Even though the audience was less but whosoever heard it was convinced beyond doubt about the compassionate nature of our Divine Mother. 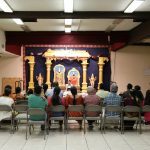 Last talk in this area was the talk in the Hindu Temple in hindi on “Guru Mahima”. 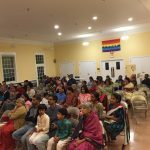 It was very well received by the audience and it was an appropriate ending to the series of talk in this area with an enthusiastic audience of about 150. People were very open and attentive to the ideas on Guru Mahima as told by PoornimaJi. They have asked to be told in advance for a satsang next time RamuJi and PoornimaJi visit the area. Thus, it was an overall Grace filled weekend which we will remember for many many years to come. We were all the more blessed with the God-given opportunity to host such great people and be of some service to Guruji.